I am currently thoroughly obsessed with my Artis Oval 10 Brush (reviewed here), and thought that you would be thrilled to learn about the truly amazing Artis Elite Mirror 3 Piece Set currently available from QVC. Artis Elite Mirror 3 Piece Set (Costs $89.00): Comprised of the perfect brushes to introduce yourself to Artis or to double up on your favorite Artis products, including the Artis Elite Mirror Oval 3, Oval 6, and Linear 1 plus the Essential Cleaning Pad and Cleansing Foam, which normally have a retail value of $154.00! 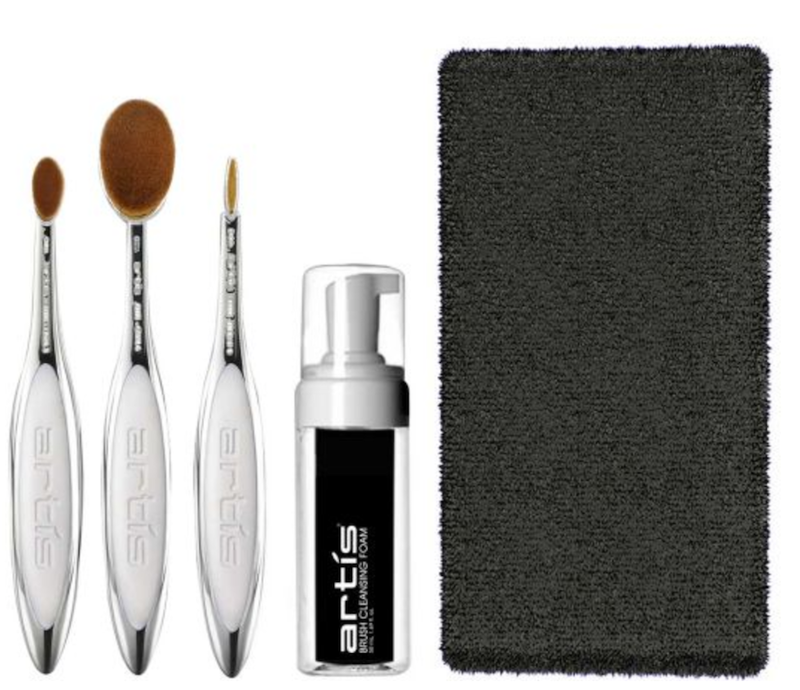 What is it: This Artis Elite starter set of brushes and cleansing system helps you perfect your existing makeup application routine. Who is it for: Anyone looking to apply makeup to get a beautiful experience that feels wonderful. Why is it different: Artis brushes are made with CosmeFibre, a revolutionary engineered fiber made for applying cosmetic and makeup products. Designed to make it easier to apply makeup, the brushes have a familiar ergonomic configuration. The Linear 1 has a very narrow (about 1mm to 2mm) row of fibers to help concentrate product application in a line, such as along the lash line. This brush can apply a precise line of product along the upper lash line or tucked under the lower lash line. It can also be used to fill in and define the brows and can simulate brow hair lines; or can be used to apply a defined line along the lip or any other part of the face. The Linear 1 brush is very helpful for special effects makeup to create crisp lines and linear shapes. You can order it now, but can also view it on QVC Friday Night Beauty this Friday, July 24th during the 11PM hour! This luxury line of game-changing brushes revolutionizes cosmetics application with its trademarked CosmeFibre® technology and an ergonomic handle for effective and exceptional application, not to mention the aesthetic design is one you might find at any high-end design store. Created by one of the makeup industry’s innovators and a former MAC Cosmetics Senior Executive, Matthew Waitesmith focused on the challenges of makeup “self-application” and delivering superior cosmetic performance, while taking inspiration from how he would draw a human face. Overall Assessment: This is a great offer from the most innovative and visionary luxury makeup brush company. I definitely want more of their brushes because I am so impressed by The Artis Oval 10 Brush. This set is a great value, and an excellent way to familiarize yourself with this gorgeous line of brushes. Artis Elite Mirror 3 Piece Set is $89.00 ($154.00 value) exclusively from QVC (Affiliate Links). Press Release. All views expressed are categorically my own. Do you know if they will be on EZ Pay Friday night? Thanks for the post. Placed my order this morning before coming to work. I've been looking at these brushes for a long time so glad they are on QVC. hope they get more. Thanks for the post. Hi again! That was a good call since they could sell out. I cannot wait to hear what you think of them! I need to get those brushes as well! Please keep me posted– my guess is that you will fall in love with them! I hope that QVC carries more as well! Hi Melissa! You definitely need to try one of their brushes! They are AMAZING! I agree! It is a great value! They look so sleek, and those bristles are so soft and dreamy! This looks like an awesome deal! Particularly if you are wanting to buy these anyway! It really is a great deal, and for anyone who has been wanting these brushes– this is the perfect opportunity to try them out! It really is, no question! I bought them. I love the Artis 10 and didn't want to miss out on this deal. That was a super good purchase, if ever there was one! I can't wait to hear what you think of them. I'm sure that I will hear you squealing in delight when you open your package all the way in LA! :-) I am just smitten with the Artis 10! I need more of these in my life!!!!! I do as well! It's a crazy good deal, too! It really is a great deal,and these are such good brushes for daily use! I need them all in my life! Wowzers... that's a great deal. I think the concept on these types are definitely interesting. It really is a great deal and value! The concept really is very interesting! Well, they are such different types of brushes that trying one of these, or this set is still worth it in my opinion. I have and use the Artis Oval 10– which is unlike any other brush in my collection, and the Beauty Junkee Set is so hardworking and durable. Yes, I am going to compare the two sets. Haven't bought this many brushes in decades! They are so different from one another that you will be able to get good use out of all of them. These, however, are so unlike anything else that you have tried that I imagine that you will be really taken by their novelty and efficacy! What a great set! I'm dying to try oval foundation brushes - ordered one from Etude House a couple of days ago. This really is! That's precisely the next brush of theirs that I want to try– the one that is small enough to apply blush or foundation! These are just genius! I can't wait to hear what you think about the one from Etude House! They really are, Courtney! It's a bit of a paradigm-shifter using them since they are SO different from the more paint-brush style brushes tha tee have become accustomed to using! It is definitely work checking to see! The deal is spectacular and the brushes are very impressive!